A new interview with Splatoon 2 producer Hisashi Nogami has been shared on the News Section On Nintendo Switch. Mr Nogami had a lot to say about the Octo Expansion and went into quite a lot of depth about how it came to be, the inspiration behind it and exapnding the Lore of Splatoon. He also spoke about how the team come up with new ideas for content and that perhaps the Jellyfish play more of a role in the world of Splatoon than previously thought. We have the how interview below so I hope you have some spare time free, it’s quite a lengthy interview. Thank you for making the time to speak with us today. Nogami: Of course. Thank you. For our readers who are familiar with Splatoon 2 but not the Octo Expansion. Can you describe what the expansion is? Nogami: Octo Expansion is paid additional content we made for fans of Splatoon to go deeper into the world and gameplay than they were able to before. Characters that fans know from Off the Hook, even characters that they know from the previous game’s Hero Mode, appear and assist the new protagonist – the Octoling Agent 8 – as they explore and eventually escape from a secret research facility in this new single-player adventure. We’ve designed the campaign to incorporate a wide variety of challenges, with many larger, elaborate levels. Ah, very mysterious. One thing that’s very striking to me is the new creature designs. What can you tell us about them? Nogami: It’s a little strange – a little mysterious – because it’s underground, right? It’s different from the surface worlds we’ve seen so far. Of course, the animals that live on the actual ocean floor in the real world evolved in unique and strange ways too, and we wanted to create a world with a lot of contrast to what we’ve seen so far from the world of Splatoon to evoke that feeling of strangeness. 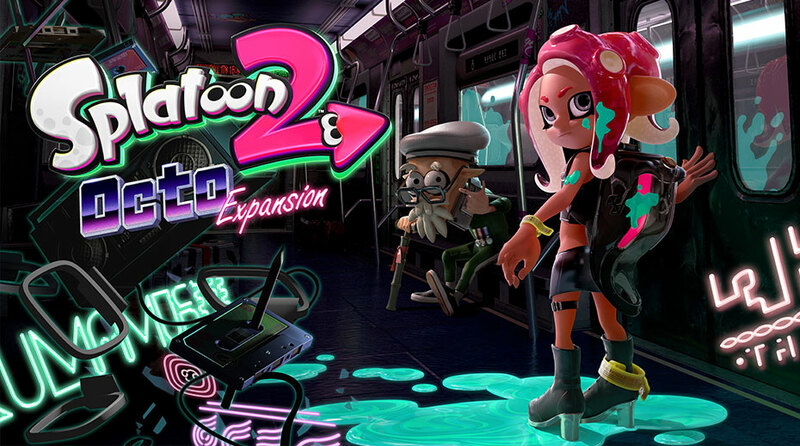 So why was it decided to have an Octoling as the main character for this expansion? Nogami: We wanted to show that this is a multifaceted world. The protagonists we’ve seen so far in the Splatoon series have all been Inklings – squid – and the truth is that the squids aren’t exactly the defenders of justice in this world. They aren’t supposed to be the “good guys.” The squids have their squid society – and while there are other creatures that they are friendly with, like the jellyfish, the squids live in a world made for squids. We wanted to show that other creatures in this world have their own societies too, and they all do what they need to do to protect what they have. It’s a way to bring richness and depth to the world of Splatoon, which we hope will bring our fans deeper in to the series. So it’s a way to showcase the different creatures and lifestyles? Nogami: Exactly. The real world is the same way, isn’t it? We wanted to show how different societies and people can understand each other and live together. Random question, but is there a reason the Octolings are also hurt by water? Nogami: (laughs) The concept behind these creatures is that they evolved to be able to transform, and at one point in that evolutionary process they lost the ability to live in the water. The Octolings evolved in the same way that the Inklings did, like their skin is a little too thin for the water now – that’s why they can transform – but just like the Inklings they can’t swim in water anymore. Nogami: Maybe you’re right! When you play the game you’ll often see jellyfish in the stands watching the Inklings battle. What if they are actually the sponsors behind these battles (laughs)? Maybe they are the ones supporting the whole Turf War Industry? Now that you mention it, they do like to lounge around by the pool. Nogami: It’s funny that you mention that. The jellyfish aren’t really individuals. It’s more like they are all parts of a larger organism. So even when you see them playing in the pool, or when you spot two jellyfish lovers hanging out at the poolside, it isn’t that they are actually jellyfish in love, but more like they want to behave like, or impersonate, what it would look like if they were jellyfish lovers. Regardless, I’m glad you brought up the jellyfish. They are another angle on this world that is entirely separate from the Inklings and Octolings. This is starting to sound like science fiction. Nogami: Isn’t it?! (laughs). As we go through development, the staff starts to think of all kinds of stories and explanations that don’t end up getting explicitly stated in the final game, but we save all the ideas so that we share and reference them together whenever we start making new content. That’s great (laughs). But moving on, can you talk about how Pearl and Marina are featured in the expansion? Nogami: In the expansion they help the Octoling navigate the subterranean passages. At first they mostly help the player over the radio, but who knows – if you keep playing they may show up in person! As for Pearl, the player may find out things about her past that explain major aspects of her character – at first she seems a little selfish, but as you play through the new expansion you might be surprised to discover how dependable she is, and what a strong moral compass she has. There are plenty of surprises about Marina too. Everything from the look of the subway train to the new characters is very different from what we’ve seen in past Splatoon games. Can you explain what inspired these changes? Nogami: We were inspired by a lot of things, but we tend to start with thinking about the gameplay. Online battles are really the basis for Splatoon gameplay, and they take place out in mostly open areas, under the sun, in a bright and colorful world, right? We want to differentiate game modes by art style, so when we were designing Salmon Run we decided to make it a little creepier, so that’s why it’s always on the verge of twilight. When we started thinking about Octo Expansion, we wanted to take the art in another new direction. You’ll find that it’s usually a little darker and quieter in the new mode – those are the elements we started with, which led us to think of the subway setting. Down deep underground there isn’t as much happening as there is up and above ground – things move slower down there – so in a certain way it’s like time has stopped. The objects are dated and nostalgic – they’re from another time. The characters also speak with antiquated slang. We thought a lot about the New York subway system and we referenced that particular mood it has when we were designing the world. Splatoon 2 is still receiving free updates such as new stages. What is the process like for coming up with brand new stages and content like? Nogami: To be honest, it’s a pretty involved process. While we think about content from all kinds of angles, we probably spend most of our time considering the functions of the new weapons. Once we figure out how we want the weapons to work we design the appearance to match the intended function. Finally, once the function and design are locked down, we test how it behaves in-game – to keep the game balanced. Having said that, there are also times that we start working from a design or an idea we like. The Splatbrella started that way. We had these memories of playing with umbrellas as children, and we wanted to replicate that experience in the game. The whole idea behind Splatoon 2 is the use of ink, that emulation of childhood games – like water balloon fights – and that those childhood games have grown into the official sports of this world. It was important to use to continue that theme of bringing childhood experiences into the gameplay. This next question isn’t directly related, but do you like eating squid or octopus more? While many of our readers have already played a lot of Splatoon 2, there are also a lot of readers out there that are new to the series. If you could say one thing to each of these groups, what would it be? Nogami: Splatoon 2 Octo Expansion was made so that people that have already been playing Splatoon 2 since its release a year ago could get a lot out of it. A consequence of this is that there are a lot of difficult challenges included in it, and some people may be concerned that it’s too hard for them. However, we designed it to feature many approaches to the gameplay – while there are tricky challenges in Octo Expansion, it can still be enjoyed at your own skill level. However, with that said, you may want to become familiar with Splatoon 2 before you try Octo Expansion. The expansion works as a great way to get back to the core mechanics of Splatoon and its characters – to learn new techniques that you can bring into online matches and vice versa. To the gamers out there that have already played a lot of Splatoon 2 over the last year: You already know that there are tons of weapons and pieces of equipment in the game, and I’m sure a lot of people haven’t been able to dip their toes into everything that the game has to offer. Many stages in Octo Expansion require the player to use different methods to clear them – like only using the Inkjet special weapon for a whole level – while other stages require players to rely on sneaking and dodging skills. Playing through the expansion will help players to discover new weapons and skills, new playstyles, and more. We wanted players to enjoy a wider variety of gameplay experiences. Did you have anything else you wanted to communicate to our audience? Nogami: Maybe just a little more about how we view the world of Splatoon 2. The game heavily features Turf Battles, and we referenced a lot of things from the real world when we were developing the idea for them. Conceptually we approached it a bit like an extreme sport – like BMX or something – one of those sports that is a little dangerous but also a lot of fun. These kinds of things tend to start as fun activities that eventually evolve into more official sports. Take snowboarding, for example. Even at the Olympics they blast music during the events and the competitors are sort of performing for the crowd, right? That’s what the Turf War battles are like. That’s why the music is so loud and youthful. It’s like all these different genres of music are all mixed together, and the only thing that ties it together is that that’s the kind of music that happens to be popular with the youth in the world at that time. We aren’t only focused on the content of the game, but also on the in-game culture and how it reflects the way cultures change over time in our world. We think about what it would be like to be a teenager within that world, and then try to make the world match what those teenagers would like, what kind of sports and activities they would create, what kind of music they would listen to, etc. There’s inspiration from all over the place, but the development staff was encouraged to think back to their own teenage years and the way they approached things. So, there are different kinds of music in the game because there are different kinds of Inklings? Nogami: Right! The soundtrack is supposed to feel like the top of the pop charts for that world. When the game is updated new songs are added, and the player can feel the trends changing over time, just like what happens in the real world. We wanted to give the player the feeling of becoming an Inkling and inhabiting that living, breathing world. That philosophy really dictates how we approach the design process, because it’s really all about giving the player that experience. I think that’s about it? Perfect, this was great. Thank you for your time! Nogami: Thank you very much.